Here are a couple of time killing end of year features that you will find interesting if you’re learning surf photography like me, it’s always nice to get some inspiration for the new year, personally I’m going to try something a little bit new for tomorrows dawny session. There are some epic photo’s featured, my favourite is this shot by Todd Glaser of Kalani Robb, the in the barrel looking out with rider shot is definitely something I aspire to re-create, even with a couple of rogue water drops this is a beauty. 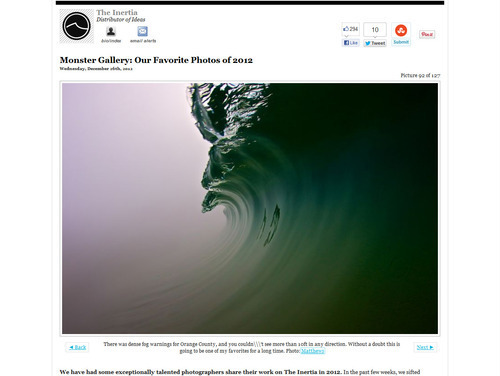 I confess, I’m not really familiar with The Inertia, but this “monster gallery” of 127 photo’s uploaded (but not necessarily shot) in 2012 has a few keepers in there, although quite a few are low res, un-credited or just a bit sub par compared to the others, they would of done well to have included half or even a third and made them all worth looking at. 46 – by Kevin Roche – portrait of Todd Glaser, shows his housing and fins which is interesting and I love the idea of a portrait without the subjects face in it. 54 – by Nate Smith – another black and white shot, fisheye looking at the beach with surfer in the tube, reminder that an excellent surfer can transform a shot. 92 – by Quinn Matthews – this is the one in the image above, doesn’t look like much at first glance and I don’t know how much editing was done but it looks like visibility in the fog is matter of yards, reminds me of a couple of sessions I had in August, before I had a housing for my camera, that would have looked amazing. Hopefully there’s a few for you to bookmark in there that will help inspire you to try something new in 2013.